University research continues to look for ways to counteract PEDV while swine operations examine and update on-farm biosecurity. Kansas State University is flexing its research muscle in swine nutrition and grain science in hopes of counteracting porcine epidemic diarrhea virus (PEDV). European farmers have been dealing with PEDV since the 1970s, but the virus wasn't found in the U.S. herd until 2013. PEDV causes acute diarrhea and dehydration in pigs of all ages. It does not pose a risk to other animal species, and is not a threat to the human food supply. Kansas State University researchers are studying the presence of the virus in animal feed, work that may help to implement further biosecurity measures and save pigs' lives. Kansas State University's Jason Woodworth, research associate professor of animal sciences and industry, is part of a research team studying the presence of the PEDV in animal feed and ways to stop transmission of the disease through the feed. "We have established that feed and feed ingredients may act as a vehicle to transfer the virus," said Jason Woodworth, a research associate professor of animal sciences and industry. "This is extremely important because feed and ingredients are not normally considered a vector in transmitting diseases." One study found that pelleted feed should be processed to a minimum temperature of 130°F to protect the feed from PEDV. 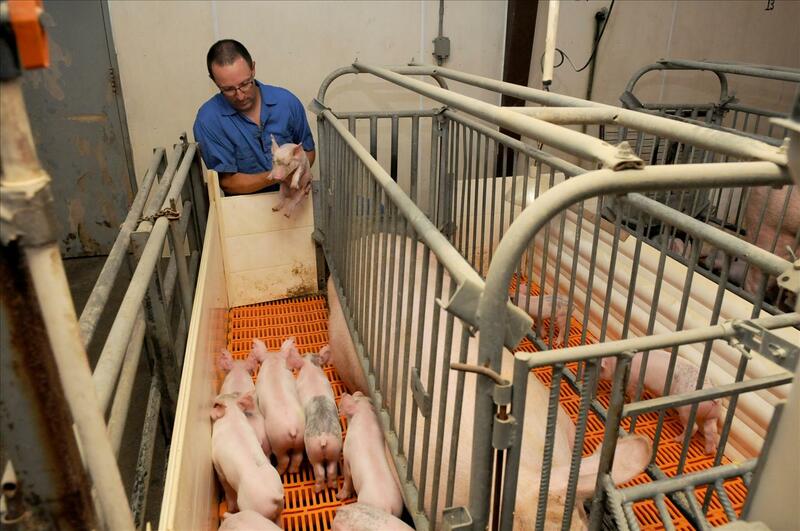 Pelleted feeds are often used in hog operations to improve nutrient digestibility and feed conversion. "The pellet mill we used in our study is similar to those used in commercial mills," Woodworth said. "By successfully determining an appropriate combination of conditioning time and temperature that can impact PEDV infectivity, we have established a mitigation step that can be implemented quickly in commercial feed production." The studies involved nearly a dozen researchers from Kansas State University and Iowa State University, many specializing in swine nutrition, grain and feed science and veterinary medicine. They conducted the feed processing portions of the research in the Cargill Feed Safety Research Center at Kansas State University's O.H. Kruse Feed Technology Innovation Center. Kansas State University's work also included determining the extent of contamination that might occur within a feed mill if a batch of feed tests positive for PEDV. By conducting this research in a secure university facility, commercial mills were not compromised and new guidelines can be applied to the industry. Additional work includes determining proper sequence of diets to minimize the potential for contamination in feed given to young pigs, and using feed additives that can prevent PEDV infectivity. "We continue to pursue feed mill biosecurity-focused initiatives because it will not only have benefits for PEDV mitigation, but it also will act to educate our industry about ways to minimize risk of other pathogens that are carried in feed," he said. Woodworth said that most of this research is funded by the National Pork Board, with support from other industry partners. Reviewing and refining biosecurity procedures are essential to ensuring the safety of our farms. The emergence of PEDV in the last few years has driven efforts to better evaluate and improve biosecurity in the U.S. pork industry. Dr. Paul Thomas with AMVC Management Services encourages swine producers to review and update their biosecurity programs on a regular basis. Through improved standards of biosecurity on farms, producers can help reduce the risk of spreading disease. Biosecurity also needs to be adjusted routinely to keep up with changes on the farm as well as when risks change. "For example, when we first started to see PEDV, most producers thought they had good biosecurity practices in place," Thomas said. "However, what we quickly learned was that common biosecurity practices were effective for helping to prevent the threat of some diseases, but for PEDV, biosecurity practices needed to be even better. "After you've experienced a disease outbreak, it's easy to remember to update and reinforce biosecurity practices," Thomas continued. "However, if you haven't had a disease incident on your farm, herd immunity might be lacking, and a focus on biosecurity becomes more important than ever." With the help of a veterinarian, swine producers should consider evaluating biosecurity externally and internally to ensure good biosecurity practices are in place. * Transportation. Make sure trucks are clean and incoming animals are disease-free. Make sure feed and propane trucks, which may have visited another farm first, are following a biosecurity hierarchy, such as visiting sow farms before finishing farms. Give all employees the authority to reject trucks that are not clean. * Employees. Help employees understand that biosecurity starts before the farm. It requires constant awareness. Employees should minimize travel to other farms or areas where livestock are kept. Establish clean-dirty lines so any exposure stops at the door. Empower employees to help identify risks for farm safety. * Supplies. Have protocols for incoming supplies, such as medication, maintenance materials and feed ingredients. This might include an evaluation and disinfection procedure as well as quarantine time before bringing supplies near animals. Internal biosecurity. Good internal biosecurity helps keep diseases from moving around a farm. Internal biosecurity includes practices such as separating new piglets from older animals that might not be clinically ill but could be shedding some amount of virus. Setting up boot wash stations within the farm is important. Consider required glove changes as well as protocols requiring employees to move from younger to older pigs. "Producers did a great job stepping up their biosecurity before last winter," added Dr. Rick Swalla with Zoetis Pork Technical Services. "We've seen fewer cases of PEDV this year, but there is still a risk, especially as colder weather approaches and the virus is able to live and spread easier. We need to continue to work together to keep up an emphasis on biosecurity again so we don't see a lot of PEDV outbreaks this coming year."